At Residential Express, we are equipped to tackle a wide variety of challenges associated with carpet cleaning for your home. From trouble spots to the regular dirt and grit that comes with everyday use, our powerful deep-cleaning equipment and solutions make a dramatic difference. How often should your carpets and rugs be professionally cleaned? For extremely heavy traffic areas, cleaning may be required more often, but as a general rule, professional cleaning services should be called in once per year. Our carpet cleaning process never leaves a sticky residue behind and can be done as many times per year as needed without damaging or reducing the lifespan of your carpet. We safely and effectively remove dust, dirt, allergens, and other pollutants from your carpet, extracting all the debris and grime that gets trapped deep within carpet fibers and leaving the texture and appearance beautiful and sanitary. When it comes to maintaining your carpet, focus on the traffic areas, because if ground in soil is not removed on a regular basis, these traffic areas will begin to wear prematurely. Another important part of carpet care is spot removal. Failure to clean up spots in a timely manner can cause a permanent stain. Be sure to visit our Carpet and Textiles Care page for helpful tips for cleaning spills and regular maintenance. There you will also find and a free, downloadable Carpet and Textiles Care Guide. If for some reason you are unable to clean a spill or spot from your carpet or rug, call us right away. 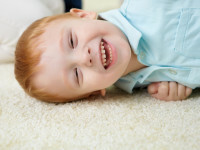 Contact us online or call 407-947-1416 today to discuss your carpet cleaning needs.